The natural foods industry in North America continues to pick up steam as mega-chains rapidly expand into metro markets both large and small. Sometimes, they set up shop right across the street from each other! As someone who has mostly patronized small, locally owned healthfood stores since 1990, the speed of this development is a bit overwhelming. Our little community recently got its very own Earth Fare, a major competitor to Whole Foods, Sprouts, The Fresh Market and Trader Joe’s. I spent a considerable amount of time in the store last weekend looking around, comparing prices and selection. While certainly not a perfect natural foods shopping experience comparable with the intimacy of a locally owned establishment, I noticed 9 things that rendered Earth Fare superior to its big box competitors. Established in 1975 in Asheville, North Carolina, Earth Fare’s slogan is “Healthy Food for Everyone”. Throughout its forty year history, the company logged several “firsts” in the natural foods industry. In 2001, it banned all foods containing artificial sweeteners including sucralose. 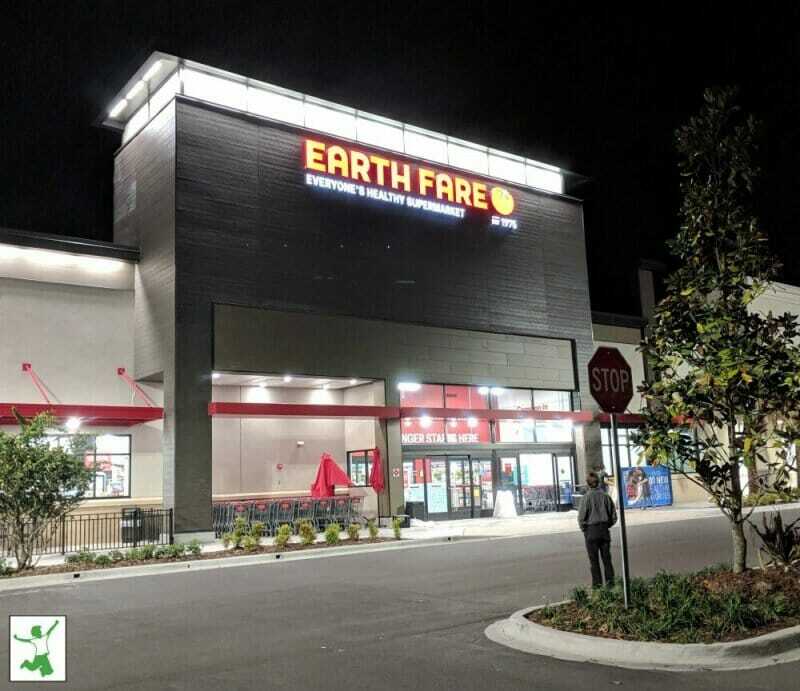 As of this writing, Earth Fare operates nearly 50 stores in the Midwest and Southeastern United States. This compares to California headquartered Sprouts with 300+ stores, Trader Joe’s with 30 locations in the Southeast, The Fresh Market with several hundred stores primarily east of the Mississippi, and, of course, Austin based Whole Foods with about 500 locations. If you’ve never shopped in a natural foods store before, you might think that they would all be virtually the same. That assumption, however, would be wrong! Each of these natural food megachains is unique in easily observable and notable ways. While I’ve only shopped at Earth Fare a couple of times so far (it just opened in my community), I already know that, with the exception of our locally owned healthfood store, I will be visiting it more often than the Whole Foods, Sprouts, Fresh Market and Trader Joe’s in our area. Yes, I actually have all of these chains within a fairly short drive from my home! So why do I like Earth Fare better? Let me share my top 9 reasons. The original Earth Fare location in Asheville, NC was only 1200 square feet of mostly bulk, dried organic foods. In keeping with this early mission, it’s no surprise that four decades later, Earth Fare stores still feature an impressive bulk foods section. In fact, I can say that the Earth Fare near me has the best bulk section I’ve ever seen anywhere. Check out this short video I took as I stood amazed when I first walked into the store. If you shop in bulk a lot like I do to avoid packaging waste and save money, Earth Fare is definitely a place you need to check out. Prior to my introduction to Earth Fare, I considered Whole Foods to be the best place to get completely unheated raw cheese (not the fake raw cheese from Organic Valley and other big brands). The cheeses are expensive, but at least you can find them! Whole Foods now has a legitimate problem on its hands with Earth Fare. In my opinion, the selection of raw and otherwise artisanal cheeses is broader, better organized and, best of all, more affordable per pound at Earth Fare. Given that cheese is the most stolen item in the world, I hope Earth Fare has its security cameras trained on its amazing selection! By the way, the panoramic shot below is only a portion of the entire cheese selection. Those of us educated in the importance of ancestral diets know that the benefits of organ meats are a frequently overlooked component. Trying to find organ meats in Sprouts or Fresh Market? Good luck with that! Trader Joe’s sometimes has a decent paté available and Whole Food consistently has medium quality liverwurst, but that’s about it! Earth Fare, on the other hand, offers several organ meat options such as pork and chicken liver mousse. They even have grassfed bone marrow! Hint: you will probably get it cheaper at your local butcher though. One great thing about shopping at Whole Foods is the additional 10% discount on sale items for Amazon Prime members. These potential savings no doubt bring in a lot of foot traffic. However, Earth Fare’s weekly specials, monthly deals and digital coupons seem to be just as good or even better by comparison. All this without an annual membership fee! Quite honestly, there seems to be a lot more deals going on at Earth Fare. Just my impression … check your location on the website and see if you agree. Ok, I realize that some people are going to take issue with this next point. The Earth Fare near me has a layout that is very similar to a conventional supermarket. I think this is a plus, since supermarkets are very easy to navigate, in my opinion, although you certainly don’t want to be doing much food shopping there even just on the perimeter! By comparison, I find Sprouts, Trader Joe’s and Fresh Market very confusing in their layout. Top that off with the low level of lighting in Fresh Market, and it is very hard to find something quickly if you are dashing in and out like I frequently do. Whole Foods has a good layout, but I must say that I like the supermarket style layout of Earth Fare the best. Even though I have shopped there only a few times so far, I already pretty much know where everything is simply because it is laid out like a modern supermarket. Yes, the ambiance is lacking, but who really cares? I’m there for the quality of the food and decent prices. I would venture to suggest that most health conscious shoppers are the same. To me, a healthfood store is an imposter if it doesn’t have a 100% organic fresh juice bar. Neither Trader Joe’s, Sprouts or The Fresh Market near me have the option to buy fresh pressed organic juice! Even the Whole Foods doesn’t have a fresh organic juice bar. It does offer nonorganic, cold pressure treated juices on tap, which I find completely unacceptable. Cold pressed milk and juice experience nutrient destruction similar to flash pasteurization. I was thrilled to discover that the Earth Fare near me does have a raw and organic juice bar, just like any reputable locally owned natural foods market. Even better, based on the sign (see photo below), it appears that all the fruits and veggies are not only organic, but also heirloom varieties, which are more nutritious and tastier than hybrids. Since I typically like to buy fresh organic juice when I shop, the heirloom juice bar alone will sway my decision in favor of Earth Fare. The healthy drinks section of Earth Fare dwarfs its competitors. The numerous kombucha brands on offer alone (see picture below) give you some idea! If you’ve got a special brand or flavor of probiotic drink you love, Earth Fare is probably your best bet to locate it. Note: it is always best to invest the time to make kombucha at home, with commercially made kombucha reserved for the occasional treat. I prefer to shop super early in the morning after dropping the kids off at school or very late at night. This way, I avoid crowds and can get in and out very fast. I also get my pick of that day’s deals (when shopping early), or enjoy last minute markdowns (when shopping late). I can’t tell you how many times I decided to head out to the store around 9:30pm only to realize … oops, all the healthfood stores are already closed! Enter Earth Fare. It is open from 7am – 11pm. Like its layout, Earth Fare seems to pattern its hours more like a supermarket for extra convenience. Here’s the clincher for me. Earth Fare delivers groceries to you door via Instacart within an hour or two of ordering. You can also schedule a specific time of your choosing. No other natural foods market in my area currently offers this! Whole Foods will likely have this service soon, but as of this writing, it still isn’t available for my location. Bonus. The first three delivery orders with Earth Fare are free. Just order groceries from any device, pick the delivery time, and answer the doorbell! Overall, it seems to me that of all the big box natural food grocers, Earth Fare has stayed truest to its original mission to offer Real Food that enables people to regain and maintain their health. This philosophy combined with an efficient, supermarket style layout, extended operating hours and home delivery offers the best of both worlds to busy consumers. Have you shopped at Earth Fare before? Do you agree with me that it provides the best *big box* healthfood store experience for natural foods shoppers? If you disagree, please share your reasons!